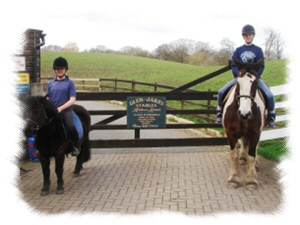 Glen Jakes Riding School is a family run business, with a friendly relaxed atmosphere to make you feel at ease. 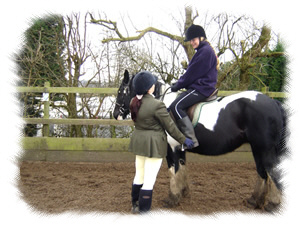 Our qualified helpful staff provide educational, informative, fun riding lessons for all. We are open all year round, on Mondays for show events, Tuesday - Friday daytime and evenings 9am - 9pm, Saturday - Sunday 9am - 7pm. We have established an outstanding reputation since 1990. The key to our success is that we provide a complete range of activities to suit all levels and ages of riding abilities from complete beginners to advanced level riders from tiny tots to mature adults. Our flexible timetable enables you to ride at a time that suits you. 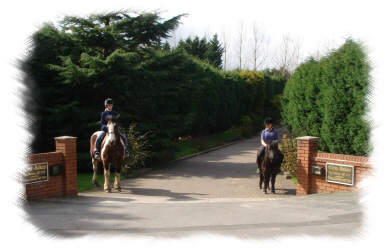 We provide a high standard of tuition on our well mannered horses and ponies, because your safety is paramount. Hat hire is available at no extra cost (if required). No other riding equipment needs to be purchased for you to ride with us. Due to our recent review of our horses and ponies workloads and capabilities our weight limit is restricted to 15 stone or 95kg. Glen Jakes Riding School gift vouchers make an ideal gift. Why not treat a family member or friend to a unique, unforgettable experience. Our vouchers are available for all our activities, including riding equipment we have for sale. These are available to purchase from as little as £1.50, and can be redeemed to suit you, since they have no expiry date. Simply contact us to organise your chosen activity. Our flexible timetable enables us to offer a variety of days and times to suit you. At Glen Jakes we realise that fun is an essential part of learning. We are keen to see progress in our riders, therefore Glen Jakes Riding School certificates are awarded for each level of riding / stable management achieved. Set your goal and leave the rest to us. We can be contacted by telephone and email 7 days a week.